This month, Causeway hosted ‘The Business of Sport’, a speaker and networking event in honour of visiting Irish Minister of State for Tourism and Sport, Brendan Griffin TD. We also welcomed Mark Hanniffy, Consul General of Ireland in Scotland, a strong champion of Causeway and supporter of our work. The event focussed on providing a professional insight into major upcoming sporting events on both sides of the Irish sea. Kindly hosted by CMS at their Castle Terrace offices which overlook Edinburgh Castle, The Business of Sport event was well attended by professionals from across Scotland, Ireland and Northern Ireland. Our speakers were business experts with a specialism in the sporting industry. Each offered a fascinating insight into their respective fields. Speaking at the event was Dan Killen, Hospitality & Ticketing Customer Relationship Manager at golf’s governing body The R&A. Having worked in the international golfing industry for almost a decade, Dan is currently working on The 148th Open which has returned to Ireland for the first time in 70 years. Dan outlined the impact that the event which is being held at Royal Portrush will have on the economy of Ireland and Northern Ireland. He also examined why The R&A has this year chosen to return to Northern Ireland, having predominantly hosted events in Scotland and England. Finally, he detailed the challenges and opportunities that The Open – the fastest selling in history - presents to businesses in Northern Ireland and Scotland. We were also fortunate to hear from Esther O’Callaghan OBE, Head of Legacy & Development at Women’s Tour of Scotland. Esther O’Callaghan OBE was named as Clarins ‘Most Dynamic Woman of the Year’ and a 2018 Women of the Year Alumni member. She is listed on the 2018 SIA Global Power 100 and International 50 – Women in Staffing. Esther’s major focus for the year ahead will be the inaugural Women’s Tour of Scotland that has some ambitious goals both in terms of legacy and youth development. The three-day event will see the top women’s cycling teams from across the world racing along a 350km course. Esther detailed the legacy that the ambitious annual event hopes to create and how this will impact on the development of the sport in future years, specifically in empowering females into cycling and sport in general. Finally, John McClarey, MD of Business Fives, and Chair of the Scotland Causeway committee, spoke to us about how Causeway has been crucial to his own business, both in expanding his personal network and raising the profile of Business Fives. 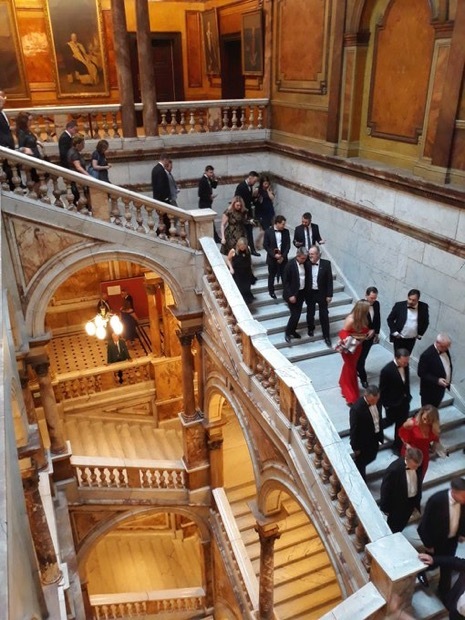 Business Fives and Business Fours run corporate sports events throughout Scotland – each one makes a charitable impact. They have recently expanded into England and have aspirations to take their corporate football, golf and touch rugby events to Ireland in the near future. As a socially conscious business with a company commitment to donating 10% of their income to charity, their clients use the events as a vehicle to fundraise for their chosen causes. This has enabled the events to raise over £75,000 for charities, over half of that within the last 12 months. John highlighted how Business Five’s clients are a shining example of how sport can be used as a force for creating a positive impact on local communities. The next Causeway event is on Thursday 2nd May and will be hosted at the Irish Consulate on Randolph Crescent in Edinburgh. The ‘Connect with Causeway’ event is a networking evening with an exciting new format designed to both empower members to feed into the development of the organisation and to connect with other fellow members. Interested in attending? Contact us to find out more about becoming a Causeway member.